Need the scoop on Wēpa? With 7 easy upload methods available, we guarantee there is one to fit everyone's personal preference! Open your document, choose "file>print" and select the Wēpa printer. Access your Box, Dropbox, Google Drive, Office 365, or OneDrive account at any Wēpa print station to print your documents. Login at wepanow.com/webupload, select your documents and "send to Wēpa." Download the "Wēpa print" driver and follow the instructions. Access and print your Canvas, D2L, Moodle, Blackboard Learn or Sakai files at any Wēpa print station. Need help locating a wepa print station near you? Go to the "WHERE TO PRINT" section below! Login at any Wēpa print station. 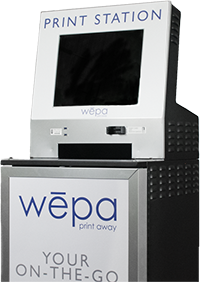 Enter your city and state or zip code to locate a Wēpa print station near you. The card you use for everything else on campus can also be used with Wēpa! Not only can you use your campus card to login, you can also use it to pay for prints! Available payment options vary by school. Add funds directly to your account so you don’t have the hassle of swiping a credit card for every transaction! Add funds by selecting "Deposit Funds" at any print station or from within your Wēpa account at wepanow.com. Wēpa print cards are fast and convenient to use! They are available for purchase at many schools and work just like a gift card. The cards are loaded in the amount of $1, $2, $5, or $10. Just swipe, grab prints, and go! For your convenience, we accept PayPal. Put the power of Wēpa on your devices! Printing on the go has never been easier. Download the “Wēpa Print” app for iOS or Android! Send documents directly to Wēpa from your personal computer and print them off at any Wēpa print station. If you prefer to use version (5.12.7.20), download. If you prefer to use version (5.7.3 for OS X 10.7 and below), download. Java will be needed. Q - Are print cards reloadable and where can I find one? A - No, the Wēpa print cards are not reloadable. Once the money is used you will need to purchase another card. Consider depositing funds to your Wēpa account using a debit or credit card. Learn more by visiting http://support.wepanow.com/how-do-i-add-money-to-my-wepa-account/. - If your school sells print cards, they can typically be purchased either in the library or the bookstore. Q - Can I get a refund for a bad print job? A - Yes, please visit http://support.wepanow.com/refund-procedures for information necessary to process your refund. Q - My Wēpa login isn’t working, but my email and password are correct. A - There could be a couple things going on here. Your school could have made some changes behind the scenes or you may actually have more than one Wēpa account. Please contact Wēpa support during regular business hours. If you are using your school credentials as your login, check first to see if you can access other school programs with that login. Q - I uploaded my document, but when I went to the print station to print it wasn’t there. A - This probably happened due to having more than one Wēpa account. Depending on your school, you may have an account that is automatically created for you, so there is no need to create another one. To access your uploaded documents at the print station, you must login to the same account that you uploaded the documents from. Q - I have a PowerPoint and want to print more than one slide on a page. A - The easiest way to accomplish this is to install Wēpa on your personal computer or laptop first. Visit http://wepanow.com/software and download the print driver that fits your computer (Mac or Windows). Your school has already installed Wēpa onto most lab computers. Once you have saved your PowerPoint slides, choose File, then Print. There you will see the option in the settings to put more than one slide on a page. This method also allows you to preview how the document will look. Q - I uploaded a document a couple weeks ago and when I went to print it wasn’t there any more, and I didn’t save it. Can you get it back for me? A - Documents that are uploaded to Wēpa are only available to print and reprint for 6 days. After that, they are removed completely from the server. Don’t see your question? Visit our support page for more information!